The Ancient Thracian tomb in the small town of Mezek in Southern Bulgaria, which is one of the most interesting Thracian sites open for visitors, appears to be compromised by the placing of a large plastic figure that has nothing to do with its history. 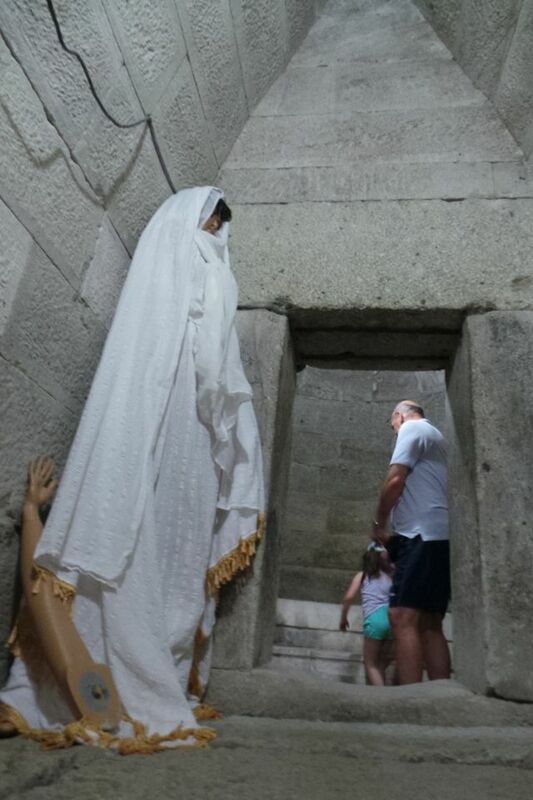 The large and apparently creepy plastic figure of a woman dressed in white “shocks" the tourists visiting the Mezek Tomb; the visitors get truly scared as the figure appears unexpectedly after they enter one of the chambers, reports local news site Stariyat Most. The first reaction of the shocked tourists is usually to step back leading them to bump their heads in one of the low arches of the Thracian tomb in Mezek, which, among other things, is known as the longest Ancient Thracian tomb, with a combined length of 32 meters of its corridor and chambers. The report says the large plastic woman’s figure, which might represent some kind of a wood nymph, appears to be completely irrelevant to the history of the Thracian monument. It points out that the explanation for the kitsch and seemingly pointless placing of the plastic figure inside the Thracian tomb has to do with the EU funded project of Svilengrad Municipality for the restoration and exhibition of the Mezek Tomb and for building a road to the Mezek Fortress nearby worth BGN 3.1 million (app. EUR 1.6 million). The project was completed in 2013, and apparently the plastic figure is part of the justification for the funding absorption. The report concludes that the only effect that the tasteless installation in the Mezek Tomb has is the scare and head bumps with which the tourists leave the archaeological monument, and that plastic figures belong at shop windows where they can be seen for free. Unfortunately, in recent years some of the numerous projects for historical and archaeological restorations all over Bulgaria have given rise to a number of questionable and even kitsch solutions whose sole purpose appears to be to somehow justify the absorption of EU funding. Nonetheless, the Mezek Fortress itself, which is near the Mezek Tomb, is a spectacular sight, as visible from a recently released drone video.